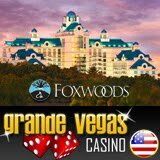 In a random draw last week, Taylor C. of California and Sheila S. of New York won a deluxe travel package to Foxwoods Casino Resort courtesy of GrandeVegasCasino.com. Everyone that played at the US friendly online casino this summer was automatically eligible to win. The ‘World at Your Feet’ promotion at GrandeVegasCasino.com continues to give players an extra 100% deposit bonus each week. Until 22 September the featured city is Dubai and players can receive up to $100 free by entering ‘DUBAI’ as the coupon code before depositing. This is in addition to the casino’s regular 100% Welcome Bonus (coupon code '100MATCH'). Deposit bonus details are on the promotion page at www.GrandeVegasCasino.com. As if more than 300 games were not enough, Grande Vegas Casino has just launched another slot machine, Goblin’s Treasure. Sneaky goblins are a wild symbol and in combination with other symbols can multiply wins by up to 25 times. Both Major and Minor Jackpots increase with every bet it's won. The Win-Win Bonus at the end of the Free Game feature can multiply winnings by up to ten times. Home of the largest progressive jackpots available to American casino players, the total jackpot pool at Grande Vegas is currently more than $6 million. There are even four games with mega jackpots over a million dollar: Jackpot Piñatas, Aztec’s Million, Mid-Life Crisis, and Shopping Spree. Grande Vegas Casino, now operated by the Jackpot Capital Group, is a deluxe US friendly casino known for its excellent customer service, reliable payment processing and stability on the American market.